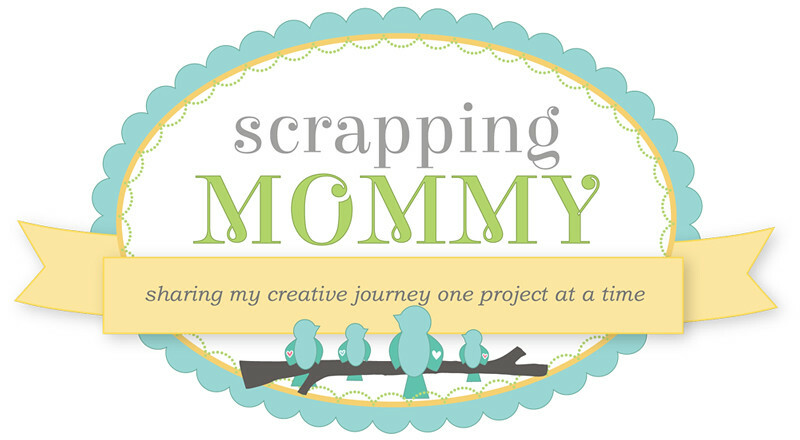 Scrapping Mommy: Two Published Cards Plus A Giveaway!! Two Published Cards Plus A Giveaway!! Hello!! Today I have two cards to share with you that were recently published in the Cricut Magazine's Birthdays Idea Book. First, I would like to thank all of you for your encouraging words and especially those who pushed me to send in my work for publication. It means a whole lot to me that you think so much of my work and I just love to share my creations with all of you. The first card I am going to share with you is on page 10 of the Cricut Magazine Birthdays Idea Book. 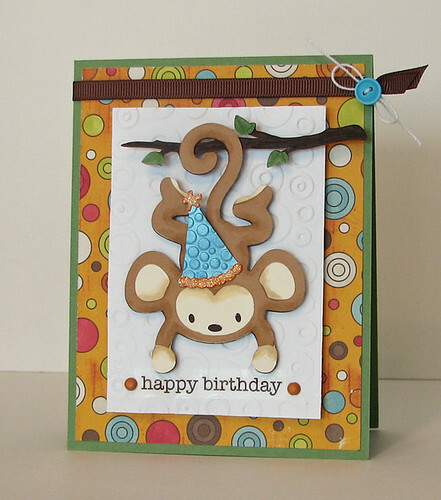 The monkey cut is from the Life's A Party cart and I used my Cuttlebug to add some embossing. 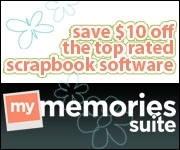 the patterned paper is from We R Memory Keepers and the sticker sentiment is from SRM Stickers. This second card is on page 107 in the same issue. The cupcakes are all cut from the Sweet Treats cartridge. I added some glitter and white pen details to the border of the card. 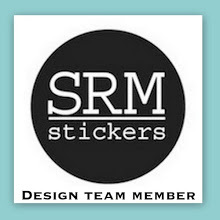 The sticker sentiment is also from SRM Stickers. Leave a comment below this post and let me know which card above is your favorite and also if you have ever submitted for publication. Only one entry per person, please. I will draw a winner via random.org on Monday August 15th. I would also like to have you as a follower or subscriber on my blog so you can keep up to date with all the fun things on Scrapping Mommy, but that is not a requirement to enter. I am getting really close to hitting another milestone on my subscribers/followers and I will have to do another FAB giveaway soon, so send all of your friends over, too. Thanks so much for visiting and don't forget to leave a comment to win!! ***This giveaway is in no way endorsed by anyone. I did not receive anything in return for this post. I am doing this giveaway on my own. My favorite is the monkey card. I have submitted for publication both had no luck. Congrats- great accomplishment!! I like the cupcake card but that monkey card is adorable!! I really like the dimension to it. As for submitting, I haven't really yet. I've sent a few things into Scrapbook News and Review and had one published but honestly, I'd never heard of it before and since it's 100% digital, it almost doesn't feel real- nothing tangible. Someday I'll submit to CK and/or Paper Crafts, etc. These are both too cute! I can't decide which I like better! Congratulations! I am a follower of your blog! It comes as no surprise to me that you were published Amy! Congratulations. Now asking me to choose between these two gorgeous cards, is like asking me to push water uphill! I love them both, but if pushed, I would choose the cupcakes. Clean, simple and very stylish. Congrats!!! I love both cards! I've been wanting to submit some of my work, but haven't had time. I would LOVE to be featured in something, one day! Thanks for the chance to win!!! My favorite is the monkey card. Soo cute! I've never even thought of getting anything published. I still feel sort of new at this. I am already a follower. Thanks for the chance to win. I really like the make a wish card. Congratulations on being published. Love your blog. I love both of these cards! Congratulations! The monkey one is my favorite. I have been following your blog for quite some time. Your projects give me ideas and inspiration. No doubt the monkey is my fav!!! Not everyone can pull off creating such a cute monkey!! I too have been following you for some time and love the projects you share with us!! Congratulations!!! I LOVE the cupcake one best - bt they are both so adorable! I have only tried submitting once, but definately plan on trying more in the future!!! First and for most, congratulations!!! Well done! 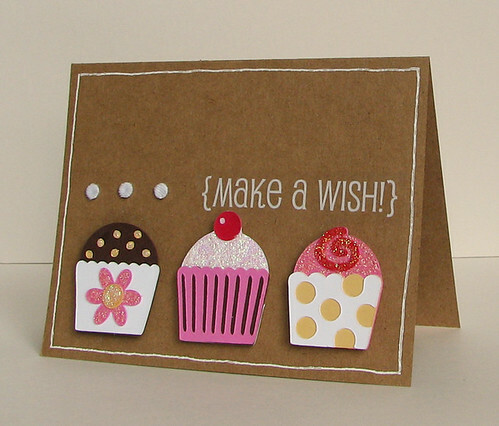 The cupcake/ make a wish card is my fave! You are very talented and I enjoy following your creative side!!! How wonderful and exciting. I've never submitted anything and am not a Circle member.I did get a "mention" in the Chirp once. That blew my mind. I love the monket card. It's just too cute. I am a follower. Love, love, love the monkey card! So cute! And congrats for getting published...how cool is that!?! :) Already a follower......so thanks for the giveaway opportunity! Oh my, both of your cards are fabulous no wonder they were published and congrats on being published as well... Well, if I have to pick a favorite I would say I love the monkey card it's so stink'in cute.. Thank so much for the chance to win.. These are soooo cute! I really like the monkey, adorable! I have only submitted twice, no luck yet. being published. I love both of your cards. So cute. You do amazing work. CONGRATS on publication! BOTH cards are absolutely adorable! I have to say that I like the cupcake one more just because it's more versatile in terms of cards that I would write to people. I also have Sweet Treats, but sometimes I think the cupcakes are a little bland. You dressed them up with your colors and the glitter that they look AMAZING! I'll have to try those cupcakes again! I've never submitted anything for publication, but I was thinking about it. I don't know if it's at the same level as other people's work, but it wouldn't hurt to try! I love your Monkey card!! I never submitted anything for publication...I'm never quite sure if my ideas are good enough. I am a follower of your blog on Google Reader. I have never submitted a card for publication but have been thinking about doing so. I love your monkey card! Thanks for the opportunity to win this book! Hi! I love both your cards but that monkey card is just toooooo adorable!!!!!!!! Love it!!!! 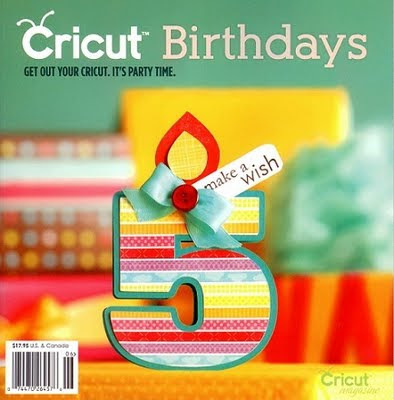 It's making me really want the Cricut Birthday's book. I don't have any of the special ones yet but it would be awesome to win one to start off my collection. I simply am a scraplifter so don't have the creative juices to make my own stuff for publication. Maybe someday!!!! Thanks for all your wonderful projects and inspiration! I have been a follower for a while and love seeing new posts here!!!!! they are both cute, but my favorite is the monkey birthday card. congrats on being published and tfs. Congrats on the publication. Your cards are adorable. Congrats on the publication! The monkey is my favorite and no I have never submitted anything for publication. These are both Supercute, but I think the one with the monkey is my favorite! Congratulations on the publication! And, I've never submitted my work for publication. your monkey card. It has lots of character! I have never submitted any cards for publication. Who knows about the future, though?! adorable cards! My fav is the monkey card, he is so cute. I have never been published but its a dream (of most scrapbookers). Congrats!!! I think I like the cupcakes best…hard to choose! Fantastic cards, Amy! I so much enjoyed seeing them in the Cricut magazine!! As always, your work has stellar design and certainly deserving of publication. Both of these look amazing but I have a sweet tooth so I like the cupcakes best. Thanks for sharing your gift with all of us! AWESOME!!! Congratulations on being published. Both cards are terrific!!! Would love to win a copy of the Cricut Birthday book. Way to go, my friend! These are adorable. I think the cupcake one is my favorite. I'm so proud of you, gettin' all published and stuff! Congratulations on getting published! That is so cool!! I think I like the monkey card the best since I have 4 little monkeys! I have never even attempted to get published. Congratulations on seeing your work in print--your cards are adorable and very worthy of the win. I used to submit scrapbook layouts and was published several times a few years ago, but always forget to try submitting a card or two. Thanks for the inspiration and for sharing your beautiful work! Congrats! I love the monkey card. I must make him for my grandson. Congrats Amy! I love both cards but the monkey is my favorite. I have never submitted for publication I don't know that I would, I don't feel qualified enough for that. I love the sweet cupcakes but the monkey is adorable. Thanks for sharing!! I am a subscriber and I have to say that I love the monkey card the best. So very cute with a lovely background paper. Congratulations on getting published! What a great accomplishment. I love the monkey. Thanks for the chance to win such a great book. Both are amazing cards, but I really like the cupcake card. Congrats on getting published! Both cards are great, but I especially like the monkey card! Thanks for the chance to win!